or painting a portrait are not required. Anyone can acquire the talent to be fairly proficient ...if you have the drive to do so? This is made even easier with the internet and the wealth of knowledge this medium spreads for free. Big water trolling is strictly all about technique. Your boat is doing most of the work before a fish hits. It's what happens thereafter that spells the difference between success, or defeat. You missing rigger bites can be fixed forever! 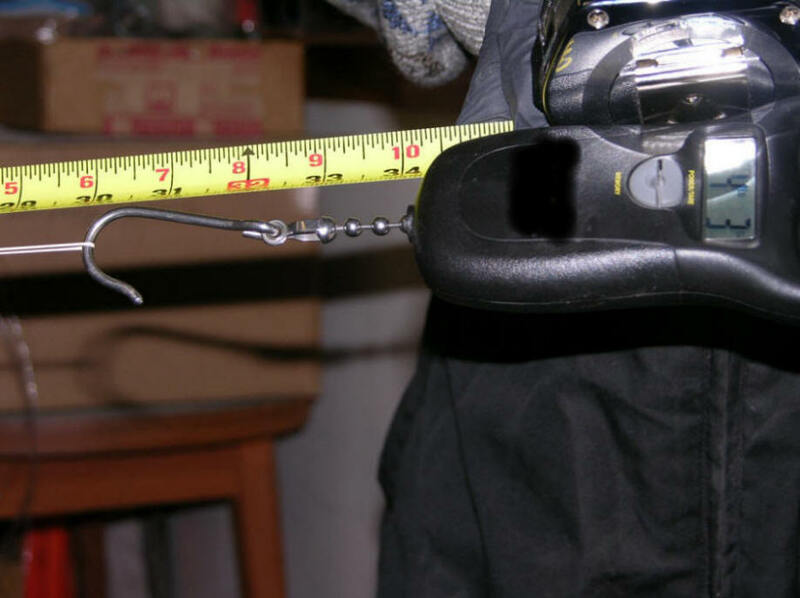 I can't put more fish under your boat, but this info will definitely turn close to 90% of your rigger bites into caught fish. 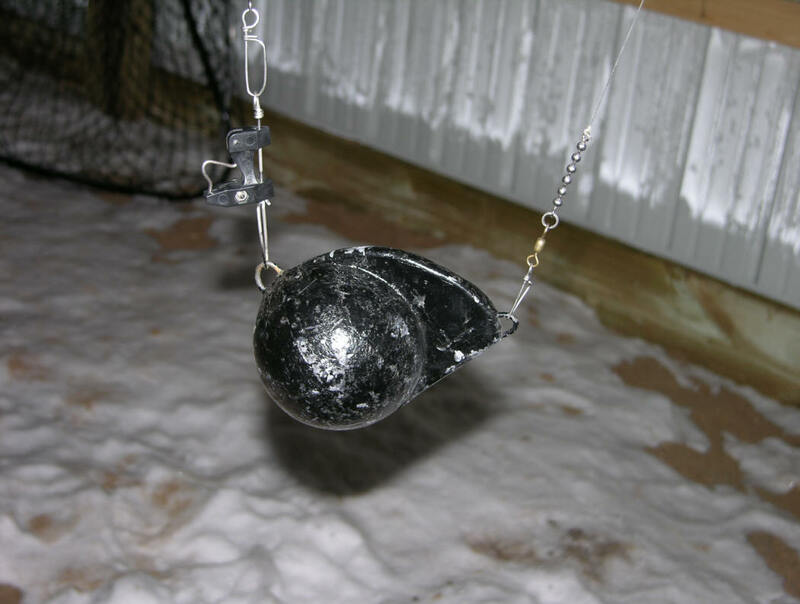 Capitalizing on every strike and not leaving missed opportunities behind is what this article is about. My study and use of rigger releases dates way back to 1969. The Road to Fish ON! 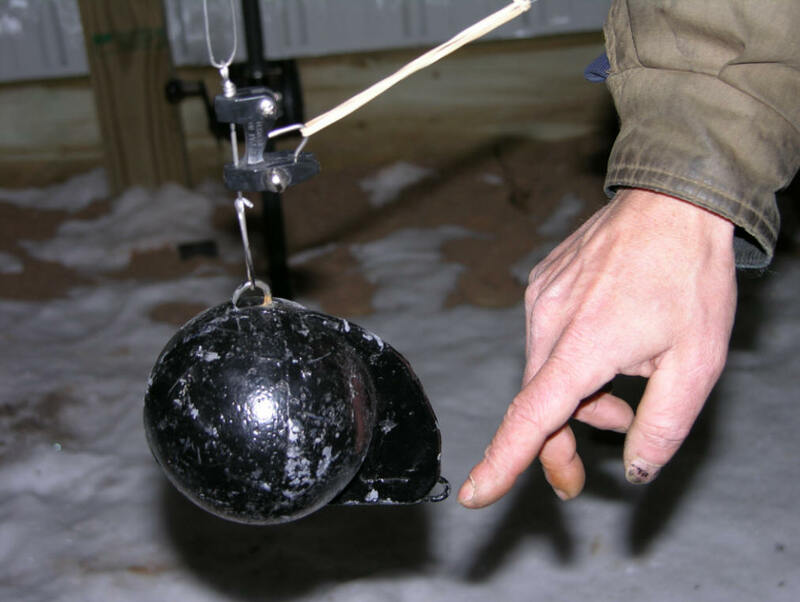 Since to the later 1960s I've used every conceivable contraption for a downrigger release. All were decent. Some releases worked better under certain applications. The reel-fact of controlled depth fishing means attaching your fishing line to a cannonball, then having it break free. Sounds simple enough …right? The goal of this article is the ever deeper and deeper fish our Great Lakes Fishery seems to be evolving to. Deep is when attractors i.e. flashers towing meat rigs, or flies rule. If you’re looking for success during the off-peak bite? Then attractor fishing is the way to go. Say you were hitting in temp fish (50-54 degrees) at 7am at 60' down, by 10am more than likely your action will come at 100' and deeper in 38 to 44 degree water. I can only offer speculation. Maybe, the more direct angle of the full sun drives the fish down, or too much boat pressure in the same area? There's an ever increasing vertical pull of the line against the release mechanism, multiplied as you fish deeper. Not to mention the pull of any attractor/lure that varies with trolling speeds. 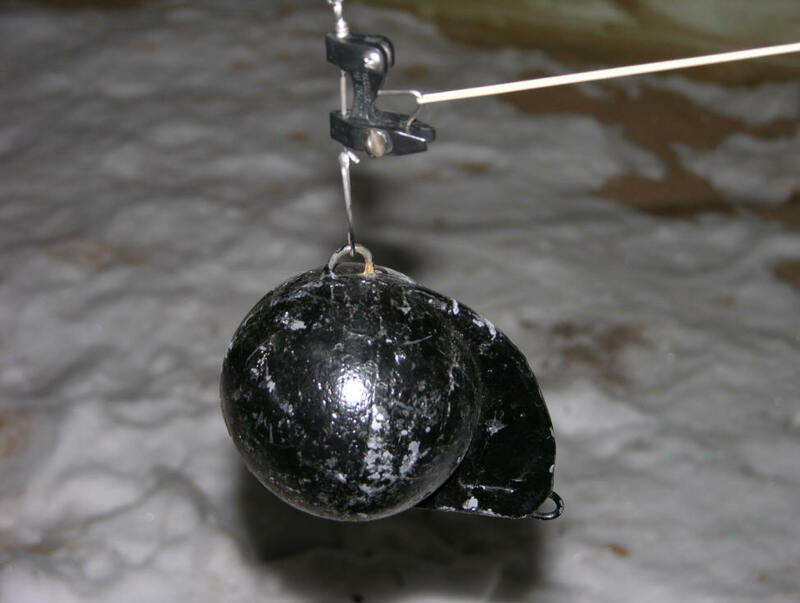 Black's Downrigger Releases offer an added benefit, as your cannonball hangs directly straight. Not titled up at a weird angle do to water pressure of the line cutting vertically thru a 100' feet of water. Those that hang releases on the back off the rear fin of their cannonballs might want to pay close attention to this reel-fact! Rubber Bands offer an elastic cushioning effect. 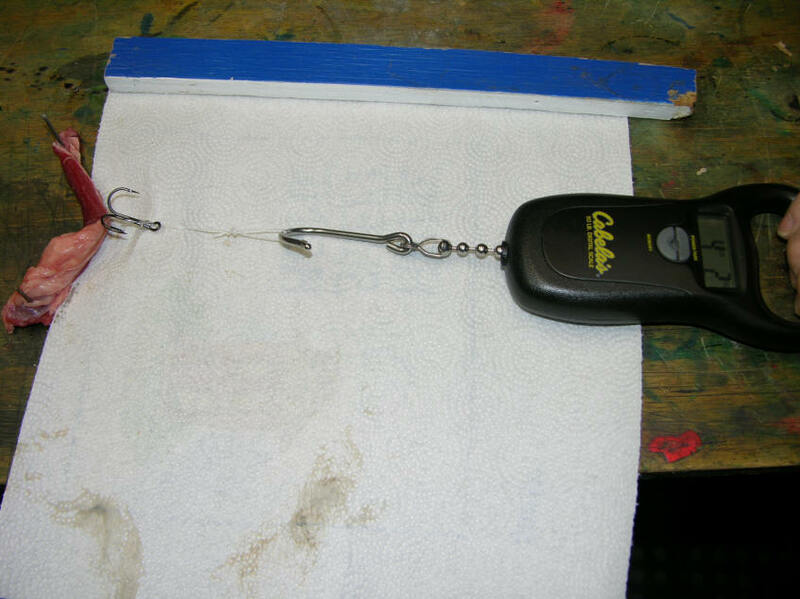 Plus, a constant positive 4 pound pull with a good 18 inches of play, or stretch to keep your hook tightly stuck. This helps a hook penetration immensely. Underwater videos have recorded the full force once a Salmon begins to feel the hook go in. Just like a surface Steelhead/Rainbow on the tear, there's a lot of violent head shaking, along with body contorting spins. 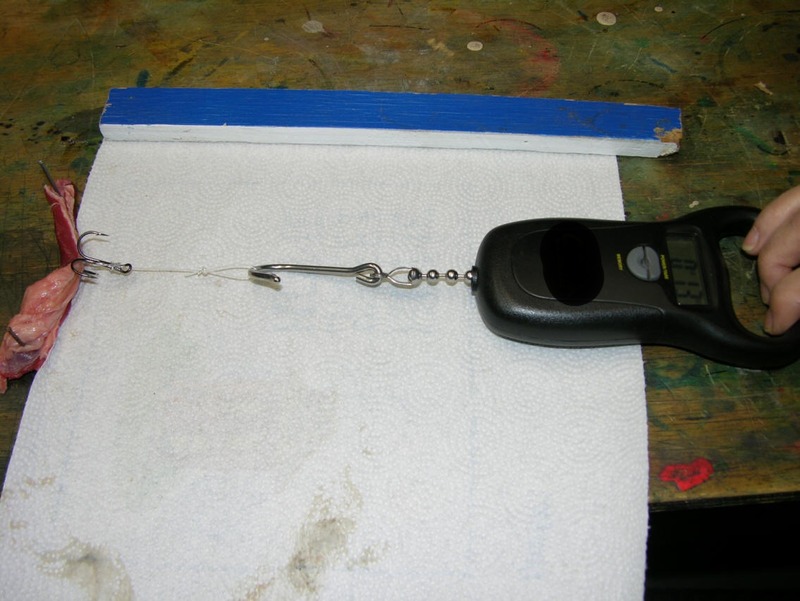 This is the time when the elastic stretch of 18" to 30" will keep your hooks imbedded into your next victim. Releases & bands are less mass to pull thru the water. Unencumbered by additional clips that might carry a negative underwater signature. This is a compact stealthy approach that will prove itself. Put another way, when there's hoards of fish, who cares if you lose a few hits? When times are lean? Then is its ultra important to capitalize on every opportunity! The system of our Downrigger Releases and bands offer a low cost, high performance, and several years of service. 5.95 per rigger is chicken feed & a cheap insurance policy after spending a $100 on gas. Fresh bands sealed in a plastic bag are a must! The Made in USA bands we offer are drop-shipped directly from the manufacturer. Not sitting around some warehouse for years waiting to be sold. 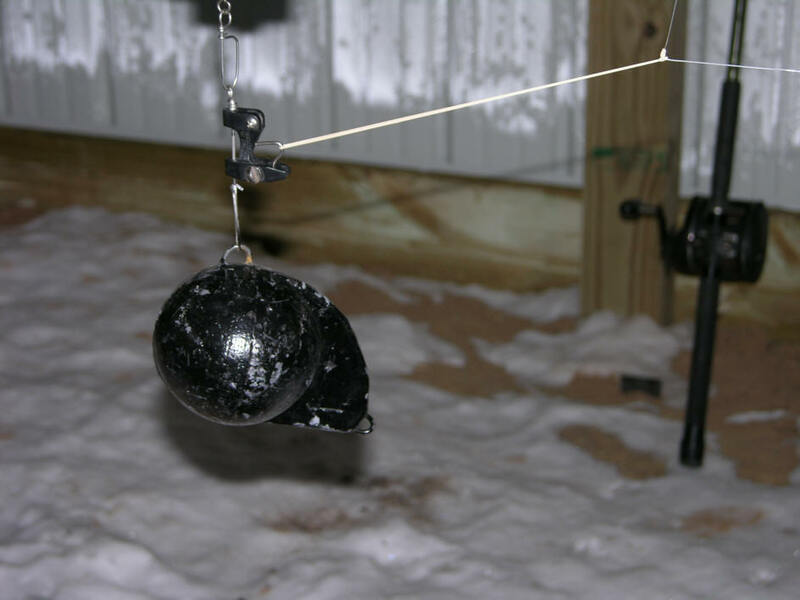 We tested the breaking point on many and that was a consistent 4.3 to 4.4 pounds. Lesser quality bands purchased in boxes broke at half this strength. For environmental concerns I made sure to offer only latex-rubber based biodegradable bands. As far, as the size and brand concerned? That’s info is closely guarded until you purchase from us. This I can say: these are not number 16s, or 32s you might have heard mention of before. riggers every second is not gonna happen on any fisherman's boat. stretchy 4 pound test rubber bands. remove slack line if you're working the waters deeper than 70'. 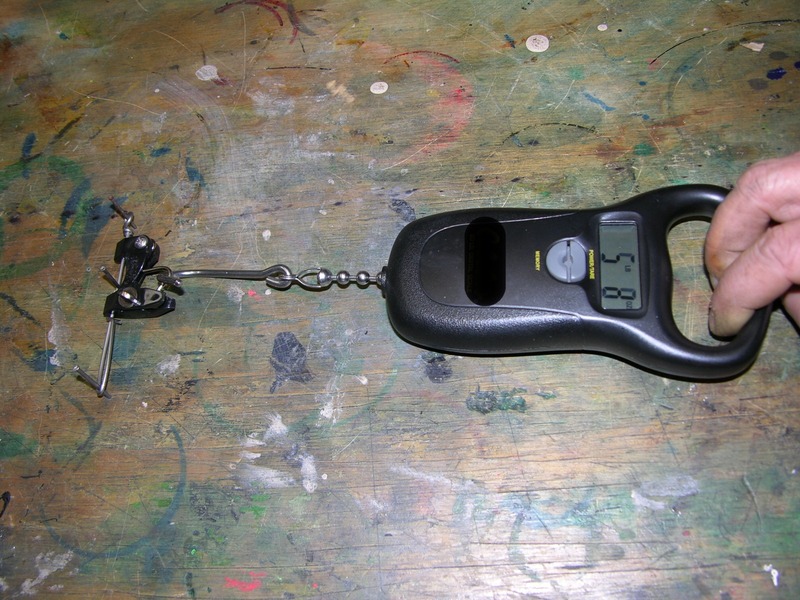 On 1/3/11 we did a pull test with a scale on a piece of tough gristle cut from round steak. 13 ozs of pull was required to pierce thru past the barb. We used the same VMC #1 hooks like on our meat rigs and trolling flies. While the needle point penetrated with far less pressure 13 ozs is when the barb came completely thru. A 4 pound draw had stretched this leathery chunk of meat and had total mastery over it. Do these Releases Work with No Bands Too? 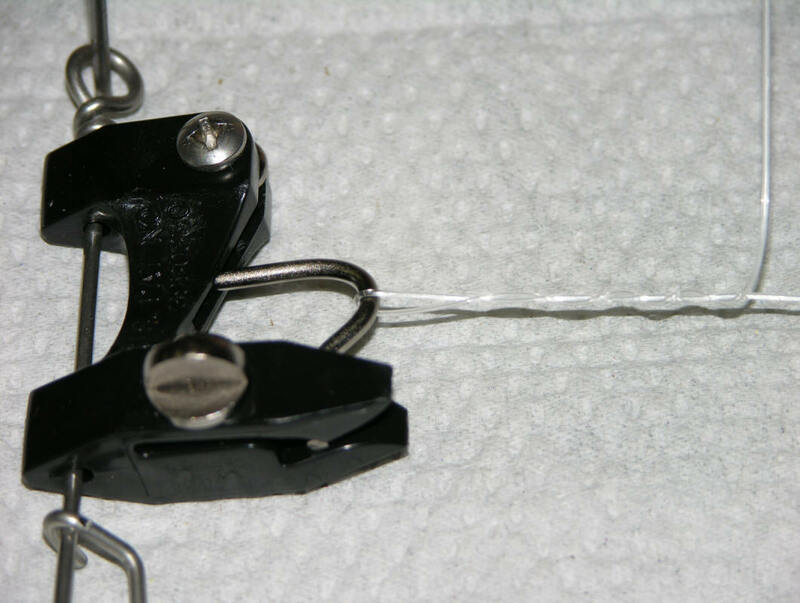 Our Downrigger Releases were designed to work by twisting your line and do a fine job like that. 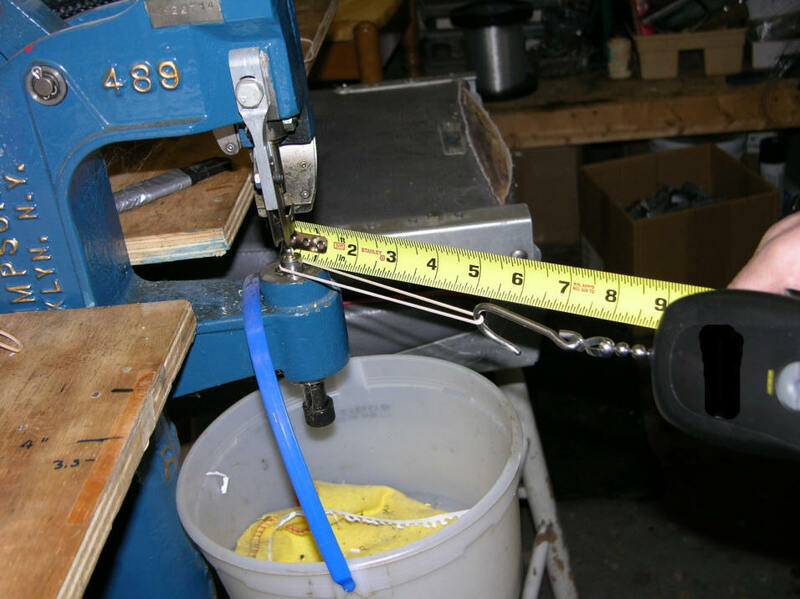 These clips offer unlimited poundage settings at a very low cost. The photo that opens this article is a Black’s release that has been in use for the past 4 seasons and still good to go. Using rubber bands is just fine tuning this release to raise your hook-up ratio and not miss bites. Plus, make it a little easier on your line. It will perform just fine less the bands. 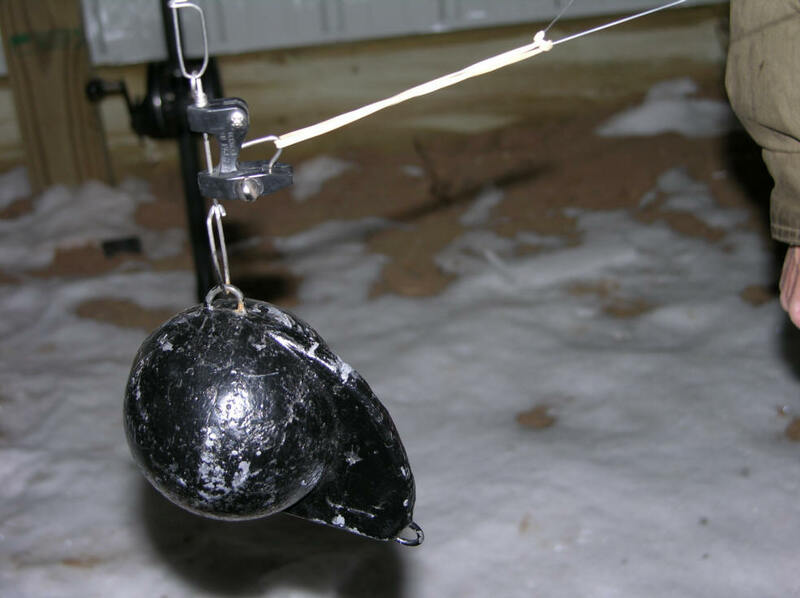 Just make sure the setting is at least 4 pounds of pull before the release arm snaps open. I set my releases tighter, as a failsafe in case I run into a "Conan" rubber band every once in a while that refuses to break. Free rubber bands are included with purchase of a Black's Release. Our rubber bands break around a little over 4 pounds of pull. 4.3-4.4 to be exact. Cost, fish ability, years of service make Blacks and Bands a super winner! my charter customers got their own rod and had to deal with it one on one. 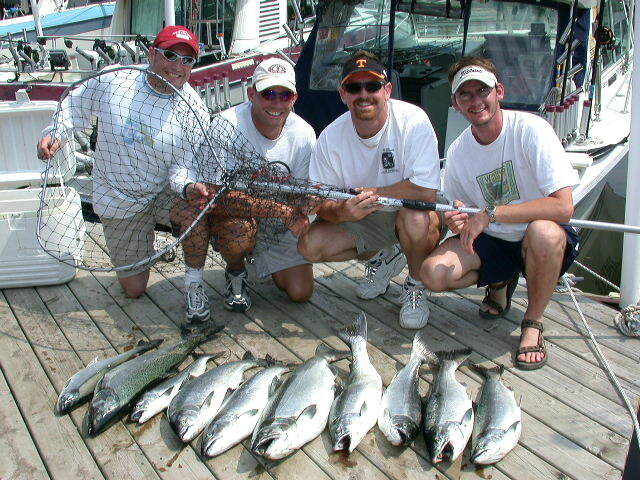 If capable, guests netted their own fish as the 8/16/03 photo plainly proves. 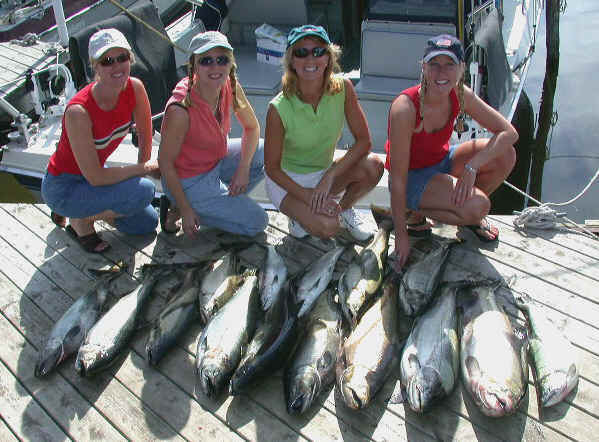 If my charter guests were going to look good in a brag fish photo? They were going to do it unassisted by a deckhand/first mate, or me stuffing a rod in their hands after we hooked their fish. Rubber bands made this possible, cuz the fish was hooked long before it ever left the cannonball. 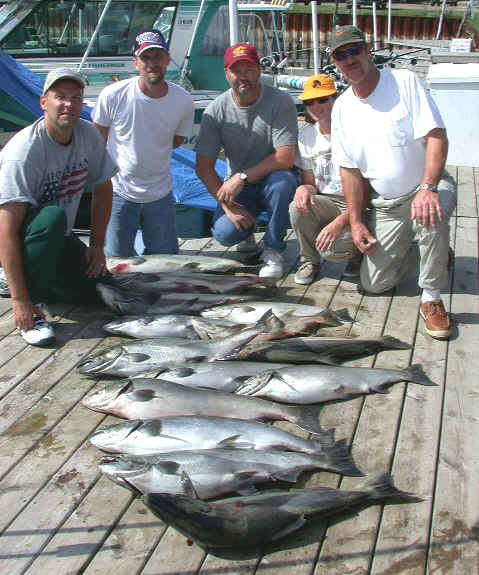 Having guests grab their rods is not normal procedure on the vast majority of charter vessels. 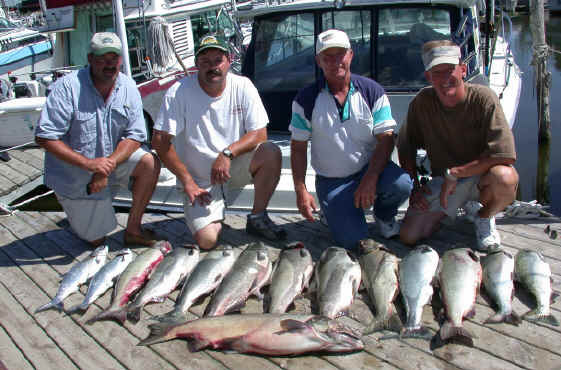 If the totally inexperienced (in most cases) charter customers can lay catches on the dock like what's clearly displayed in the above images, ...just think what you can do? Furthermore, if boxes up to, or well over 200 pounds don't convince you to switch, nothing will!